A member of the pea family (Fabaceae), the smoke tree derives its name from its plume-like growth and golden color, which give the tree the appearance of smoke. The smoke tree is a spiny, intricately branched shrub or tree that grows to a height of 20 feet. It has a small, crooked trunk with scaly, gray-brown bark. It has a compact crown of smoky gray branches and twigs with dense, pressed hairs and many small gland-dots. The smoke tree's tiny, stalkless leaves are 1/8 by 1/2 inches and appear for only a few weeks each spring before the tree flowers. The leaves are gray, very hairy and have gland-dots and wavy edges. Since the leaves appear for only a few weeks each year, the smoky gray twigs must produce most of the plant's food by conducting photosynthesis themselves. 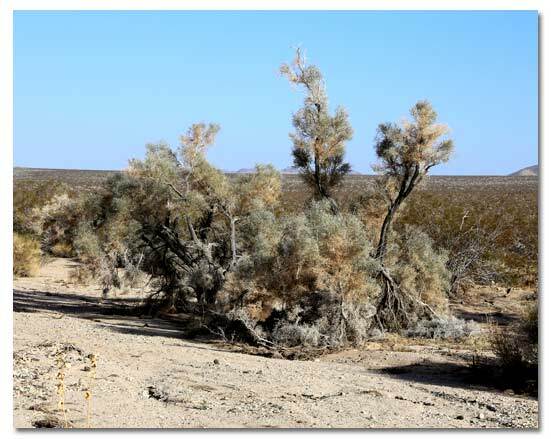 The Sonoran Desert of extreme southern Nevada, southeastern California, western Arizona and northwestern Mexico. 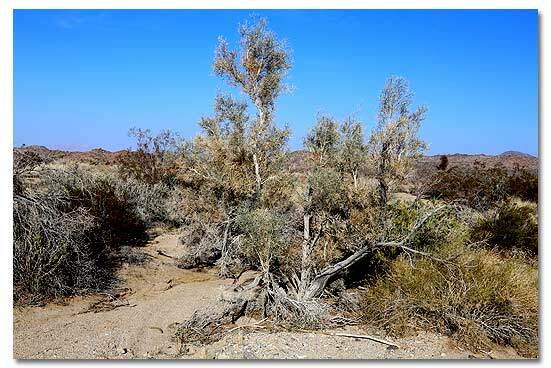 Smoke trees require relatively abundant water; they are often found along sandy or gravelly flats, arroyos and washes, often with creosote bush, from elevations below sea level to 1500 feet. Half-inch, dark purple or violet flowers grow in 1 1/2-inch clusters along leafless twigs. These colorful, pea-like flowers bloom in late spring and early summer. A small, hairy, egg-shaped pod ending in a point contains one brown, bean-like seed which matures in late summer but does not open. The pod itself is covered with fine, grayish-white hairs.